We have discussed this matter so many times that a wooden bench is especially associated with the outdoor spaces like garden and patio. 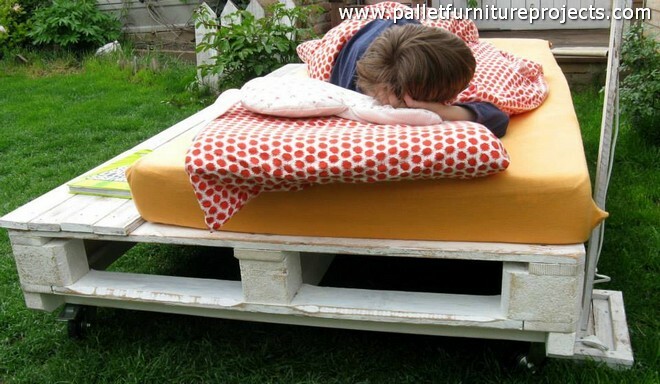 That is why we have worked a lot on making the pallet wood benches, plus we have another liability today and that is the daybed. This is another common furniture article that is needed in every well settled and designed house. But you are not supposed to follow all the stereotypes, you have full command over the designs of the said furniture items so you can mold and shape them according to your priorities, so is done here with both the articles. 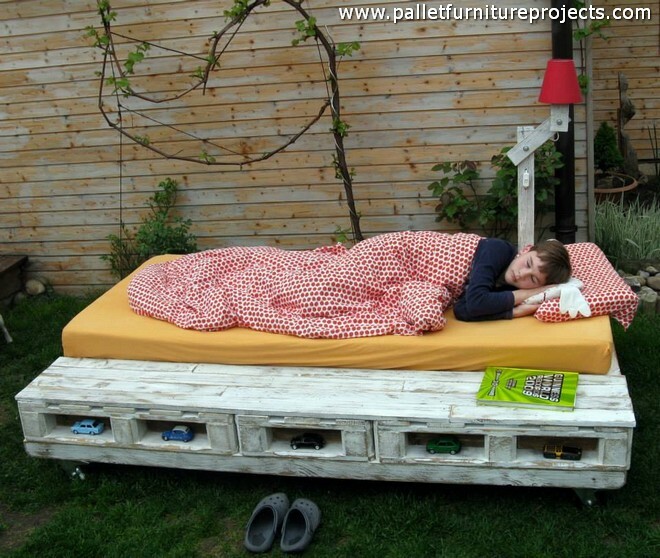 This is strange pallet wood creation apparently, a large wooden couch that has got two large table on both sides. As we said earlier that we are not going to follow the conventional shapes that are prevalent in the market. So we just did it right our way. 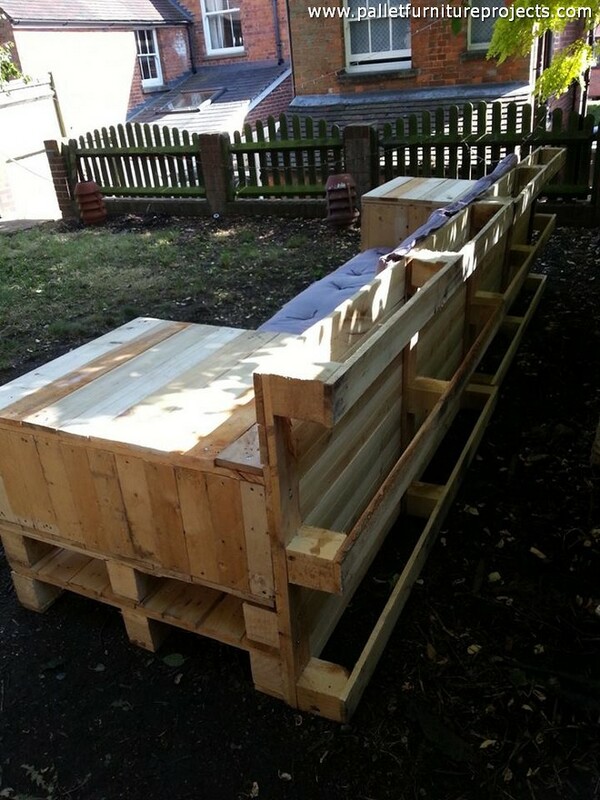 We were left with a bulk of pallet wood supplies, so we made a grand outdoor wooden pallet bench that has got two side tables with immense storage space inside it. This space would be utilized certainly in the smartest possible way. 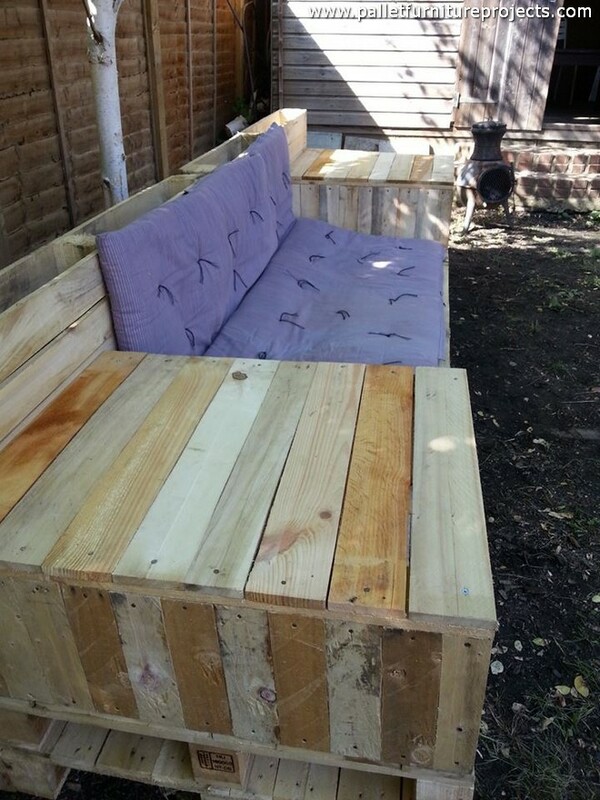 Next comes the phase of recycling a wooden pallet upcycled outdoor daybed. Well, this is obviously different from the conventional room bed in all aspects. 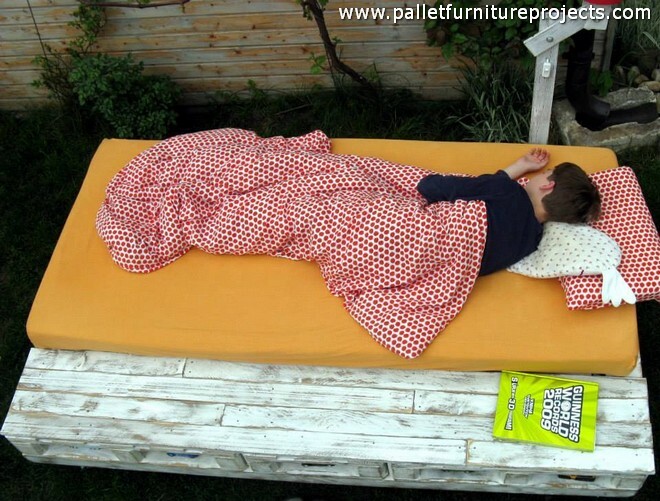 A daybed is needed specifically in outdoor when you need some little naps after getting free from the work or may be when you need to take a sun bath, in both the situations that pallet wood bed is an ideal furniture item that would allow you the easiest posture. So I think for many of you who like sitting outside for some longer spells, this is going to be an immensely exciting project. 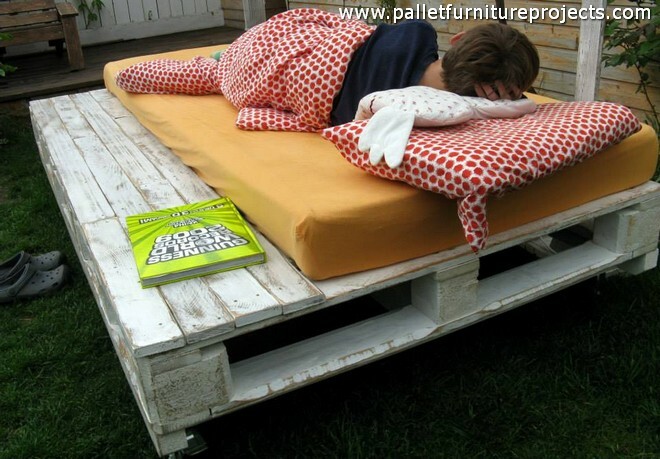 First of all we used some relatively fresh shipping pallet planks is making the whole frame of this wood pallet daybed. 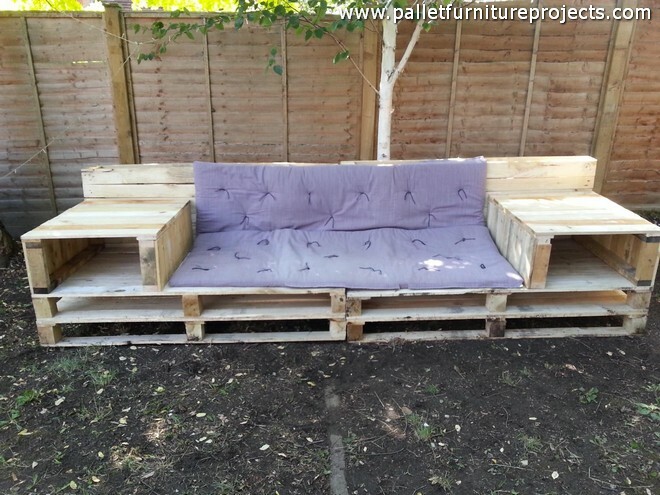 As this is meant to be the centre stage among all other outdoor pallet wood creations. We just grabbed the pallets and dis assembled them first, and made the basic frame that is quite similar to the conventional room bed. It is having by default certain open spaces right below, which we have used to display some kids toys especially dinkies which kids love the most. Placing them is also a way of decoration. Plus we kept it pretty low to the ground, that is another major distinction of this outdoor daybed. We didn’t paint it properly because this was supposed to be used outside, so we just mainly focused on the design of the daybed. And lastly we installed some heavy duty metallic wheels on the base of the day bed. There are certain potential benefits of the wheels installed on the base. This is done to ensure your ease like there might be a time when you need to drag the daybed on some shadowy area far from the direct sun rays, you would be in a better position to move this large structure single handedly.